Home Sports Teddy Bridgewater Bio, Parents, Height, What Happened To Him? With many accomplishments to match his statistics, one would wonder if he was born like every other human. In the year 1992, Teddy Bridgewater was born as Theodore Edmund Bridgewater II on the 10th of November precisely. He is the youngest of four children among whom are 2 older sisters and an older brother, Andrea Bridgewater. He got his inspiration for football from watching his big brother Andrea play with his team. Teddy started training at the age of six and when the opportunity presented itself through a ball he caught while watching his brothers team in training, he was ready to take it on. He carried on with great strides both in baseball and American football, but ultimately football was his call. Teddy Bridgewater found a wider berth in Miami NorthWestern High School where his talent was easily spotted so much that he earned the quarterback starting spot in his second year in school. This move forced Jacory Harris to be replaced as starting quarterback in the team. Teddy had a remarkable junior and senior year with football in high school as his athleticism was phenomenal. Furthermore, he went on to Louisville College, where he studied sports administration and replaced the team’s starting quarterback. He maintained the starting position, only losing his spot to injury. He became one of the biggest prospects to be drafted in the 2014 NFL Draft and he was drafted by the Minnesota Vikings in 2014. Teddy Bridgewater was signed on a four-year rookie contract worth $6.85 million. He started out as the backup quarterback for the Vikings behind Matt Cassel before making the starting spot his own when Cassel had an injury layoff in his debut season. After four seasons with the Vikings, Teddy left the franchise and signed a one year contract with the New York Jets in 2018. He would, however, be traded to the New Orleans Saints in the same year. So far accumulated 6150-yard passes and 28 touchdowns, 22 intercepted passes, and 64.7% of passes completed in just 32 games played in his career. Unfortunately, Teddy Bridgewater was out of play for the most part of the 2016 season, because of an injury he incurred during a training session. His doctor confirmed that he will be out because of the injury for at least 19 months which meant that he missed the 2017 season as well. He had suffered an ACL injury (anterior cruciate ligament) and a dislocation of his knee joint and had to observe some rehabilitation sessions but he made a quick recovery. The Saints quarterback has a net worth of $2 million accumulated in a career period that has spanned over four years. He has also banked the whopping sum of $12,850,283 in earnings so far and we know that this value will see more increase as the athlete powers on. Teddy Bridgewater was born to black American parents Teddy Bridgewater Sr and Rose Murphy. But his mother raised him as a single mother as his father was largely absent from his life. He was raised in Liberty City neighborhood of Miami. Rose Murphy encouraged him to be steadfast in athletic activities, as he had played both baseball and football in his early days. She enrolled him into the junior league and even served as his personal coach, spurring him on to achieve perfection in the game of football. She had been diagnosed with breast cancer but she fought through the disease and won. 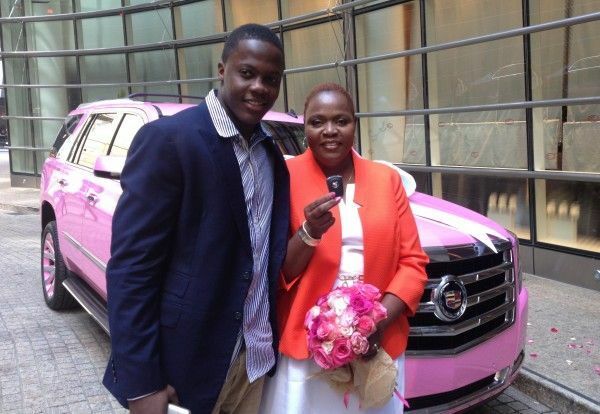 In appreciation for all her support, Teddy desired to gift his mother a Cadillac SUV, and his wish was granted as the Cadillac company gifted her a Pink Escalade Cadillac. Currently, Teddy Bridgewater stands at a height of 6 ft 3 in (1.91 m) supported with a weight of 98 kg (215 lb). He is dark skin toned with dark brown hair and eyes. He professes Christianity as his way of life and he has a long-time girlfriend, Erika Cardona. They met when they attended Northwestern High School and they have been together ever since.